Taira Masaji Sensei's Okinawa Gojuryu Kenkyukai: "Polishing Karate Waza in Gasshuku"
"Polishing Karate Waza in Gasshuku"
"Polishing Karate Waza in Gasshuku" (Training Camp) in New Jersey State, U.S.
To the question, "Which Kanji character would you prefer for the word, Kata ?" Taira Sensei immediately responded by pointing to the Kanji「型」 Hanshi Masaji Taira (62 years-old), 9th Dan, elaborated by stating "Because this character defines vivid dimension." He is from Naha city, Okinawa, the president of the Okinawa Goju Ryu KenKyu-Kai and has been actively propagating this style of the arts internationally. 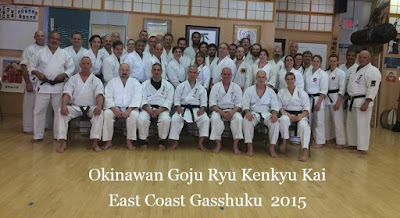 A Karate Gasshuku Seminar (camp training) was held for three days from April 24th - 26th, 2015 at "SanBu-Dou" Karate School in Jamesburg, New Jersey, U.S.A. The large doujou of 214 M2 is equipped with the traditional RyuKyuan training tools, the names of the Katas in Kanji characters and the training code were on the walls. The doujou held 40 participants comfortably, mainly Yuudansha (black belts). There were people from N.J. , N.Y., Washington D.C, California, and about ten Canadians. One out of four couples that attended was John and Nancy Eccles from near Albany, N.Y. They expressed their joy in being a part of the seminar this year. Also, they spoke of visiting Okinawa in the future. Sensei Mark Kapel (47), 7th dan who has hosted the seminar was a school teacher before he had decided to teach only Karate. He is a representative in the east coast area for the Okinawa Goju Ryu KenKyu-Kai system. The seminar called, "Bunkai Drill" in both Japanese and English was conducted in bi-lingual style so everyone could understand. Sensei Taira thinks that " Seeing is Believing." He consecutively kept applying some portions of the Katas like "Saifa" and "Sanseiru" in detail, in order to explain the Wazas in a practical manner. Right next to his practical application he asked one of the students to perform the part of the kata he was doing, Bunkai-drill. The participants attentively practiced by observing the joint-waza or shime-waza. Katas and the bunkai-applications are simply demonstrated. "Americans express what they want without any hesitation. Their attitude is direct. " They want real stuff " emphasized Taira sensei. Also, he stressed the importance of a quick response to any situation to react immediately and get away. That's why you need to train in your basic drills, katas and techniques. " They are the fuel for your quick mindedness, in order to be able to handle any unexpected situation." He definitely showed this practice, as he spoke and demonstrated. Sensei Taira continues "Once their basics are strengthened, their levels will go up accordingly. Then they will be O.K. for their next level. I'm not hiding any secret techniques from them. By teaching and showing everything I've acquired, I become more creative because of my students. They encourage me to be able to create even more techniques. We can thrive together and learn from each other. That's the reason the name of our style is: "KenKyu-Kai," = Association of Research." "They are usually built large and strong, but as they grow older they realize that the muscles by themselves are not going to get the job done. They gradually become aware of the importance of obtaining the basic techniques, because the strong muscles alone would not be effective any more." Sensei Taira emphasized the need for accuracy and repetition of practical training in concluding the interview. Mr. Taira was born and lived in the off island, Kumejima. The family moved to Naha area as he began senior high school. His Karate training began when he was a freshman in H.S. He was one of the last graduates of "The 52nd Division of the RyuKyu Police Academy." He decided to devote his life completely to Karate finally, when he was 54 years old.